Sometimes even the best USA betting sites can’t seem to make up their minds. When that happens we get what we in the best online sportsbooks biz call a “pick’em.” And the New Orleans Saints versus the Minnesota Vikings game is a classic example of that. Moreover, it will be a rematch of the ‘Minneapolis Miracle’ 2018 NFC divisional round game. As you’ll remember and Marcus Williams won’t forget, Case Keenum and Stefon Diggs completed a 61-yard TD in the game’s dying seconds. All things considered, Drew Brees must be heading into this one with a chip on his shoulder. After all, it’s usually Breesus who performs the miracles on the gridiron. If we go by QBs, the Saints should be the best online sportsbooks straight-up favorites. Brees has 13 TD passes. That’s one fewer than Kirk Cousins. However, the latter has three picks to the former’s zero. Cousins also has more yards but Brees has a higher completion percentage. And going by records and winning percentages, Brees has the better team. And the Saints can take solace in the fact that Keenum can’t hurt them anymore. Or any other team, for that matter, except his own. 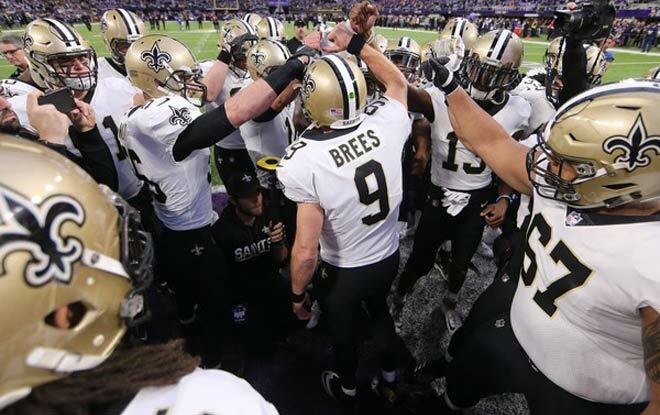 The Saints are the best team against the run. Thus, don’t expect Dalvin Cook or Latavius Murray to be tapped too many times. On the contrary, expect Cousins, Diggs, and Adam Thielen to bear the brunt of the workload. Last time Cousins faced New Orleans, as a Redskin, he had three TDs on 322 passing yards. And that’s still 44 yards fewer than the Saints are allowing per game this season. Our Pick: All things considered, customers of the best online betting sites should go for the over. The Saints scored the second-most points per game this season. And the Kirk Cousins-led Vikings offense is competent at worst. In fact, it seems New Orleans brings the best out of opposing offenses. Their games have averaged a combined average of 61.1 points.